Sieger Can Opener 1940s. German brand. Another very well-preserved model of this famous can opener. 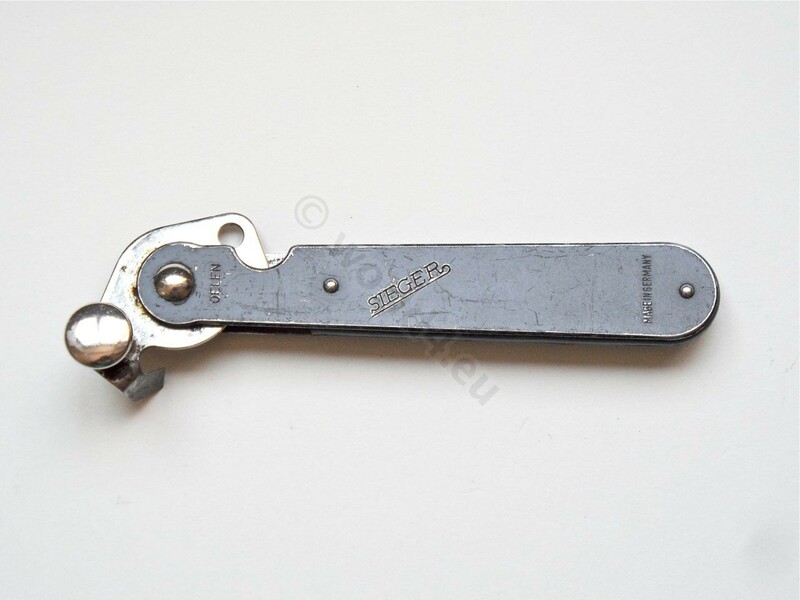 The upper part of the can opener is made of a specially hardened steel. On the top part is a small hole that was intended for the lubrication of moving parts. The handle is made of black painted Nikel. Inscription, “Made in Germany”. Manufactured about 1940. This model was part of the equipment of the German Wehrmacht. Produced by August Reutershan GmbH. & Co. KG. Solingen, Germany. Established in Solingen in 1864. The company produced the Cork screw “Cork screw furnished with a bell-shaped housing” Patent Number 4658678 and “Cork screw having a bell-shaped housing” Patent Number 4570512, kitchen tools, penknife blades, Pocket Knifes, and in 1913 the Can Opener SIEGER. SIEGER Can Opener belongs to the official basic equipment of the German Wehrmacht during the World War 2. Previous PostSieger can opener, Torpedos, Wet up extra. 1970s Germany. Next PostAntique can opener. D.R.P. German Brand Sieger.